The legislative strategy for House Republicans in the new legislative session makes a priority a bill addressing teacher compensation and performance, calling it the “Missouri Teacher Quality Act.” That has now been introduced by Elementary and Secondary Education Committee Chairman Scott Dieckhaus (R-Washington). The legislation, House Bill 1526, has four components. Dieckhaus says the foremost of these addresses teacher tenure, replacing permanent contracts with contracts ranging from one to four years based on a teacher’s evaluation and performance. 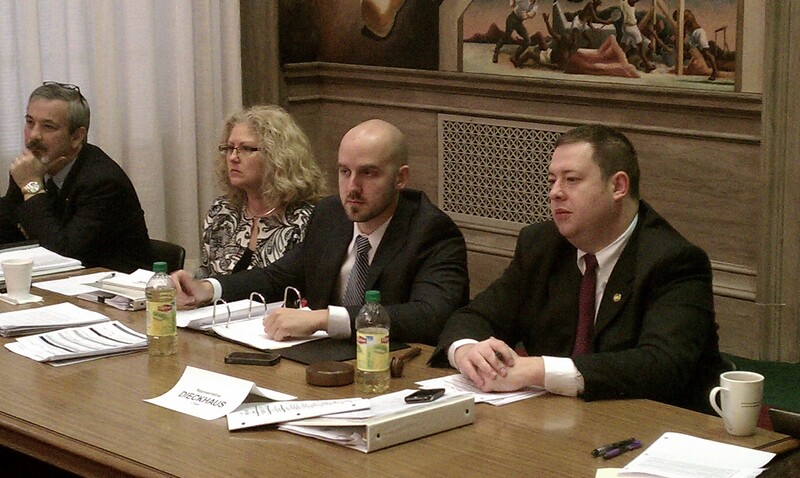 Representative Scott Dieckhaus (right) has introduced what Republicans call the Missouri Teacher Quality Act. Another piece removes the last-in, first-out policy that sees the most recently hired teachers targeted first when a district trims staff. “Instead we’re looking now at performance measures and trying to keep the best teachers and letting those go that maybe aren’t performing as well as their colleagues. Dieckhaus says the bill changes the education profession in a way that makes decision based on data, performance and output and he says that makes sense. The bill could receive a hearing Wednesday before the House Committee on Elementary and Secondary Education.